One of the most appealing traits of vintage watch collecting is that extremely unusual, collectible and attractive timepieces can be found at all price levels. The present Tissot chronograph, for example, is as striking an example of vintage steel chronograph as much more important models. 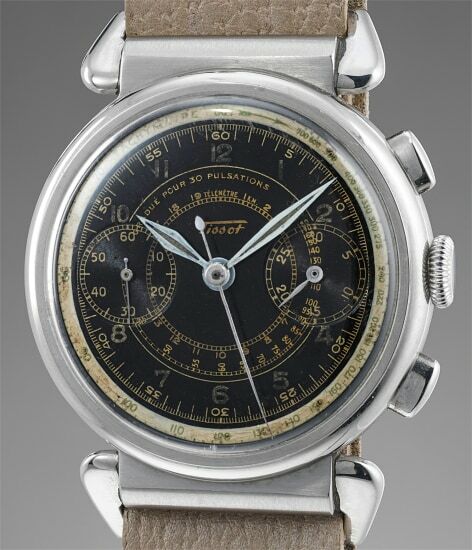 Its style can be considered somewhat transitional: the dial incorporates characteristics typical of the 1940s, during which dials with abundance of graphic elements - scales, railway divisions - were common and case designs were usually very streamlined. In this present watch, the complex case architecture is closer to the 1960s/1970s taste, characterized by elaborate case designs but very simple and clean dials. In a sense, then, the timepiece incorporates the best of both eras. Considered that such an attractive and unusual timepiece is available for a relatively affordable price, this is a testament to the width and breadth of the vintage watch panorama.